As the restaurant critic for Salt Lake City Weekly, there's no question I hear more frequently than, "Where should we eat?" This is especially true on state holidays like Pioneer Day, when visiting friends and relatives descend upon the city. So, here are 15 terrific Salt Lake City eateries that I'd stake my reputation as a food writer on. Whether you're visiting our fair city or call it your home, you owe it to yourself—and your taste buds—to give them a try. Valter's Osteria (173 W. 300 South, 801-521-4563, ValtersOsteria.com) is named for Valter Nassi, who runs this classic Italian restaurant like a maestro leading an orchestra, all the while taking time to hug customers old and new, and kiss the hands of dining damsels. Be sure to try his linguine alla vongole and the signature chicken picatta. There is no shortage of Mexican eateries in our city, but when the band Los Lobos comes to town, they always head to Red Iguana (736 W. North Temple, 801-322-1489, RedIguana.com), a perennial winner of the City Weekly Best of Utah Award for "Best Mexican." Mole magic is practiced in this funky, lively cantina-restaurant—a place so popular that a second location, Red Iguana 2 (866 W. South Temple, 801-214-6050) became necessary. Operated by the Cardenas family for decades, it features South of the Border fare that's hard to top. For refined Mexican fare, head to Frida Bistro (545 W. 700 South, 801-983-6692, FridaBistro.com), named for Mexican painter Frida Kahlo. The bistro offers flavors and ambiance as vibrant as Kahlo's paintings, with dishes ranging from blue corn-dusted calamari and roasted jalapeño aioli, to grilled buffalo tenderloin with creamy cotija polenta. Local pho aficionados rave about Pho Tay Ho (1766 S. Main, 801-466-3650, PhoTayHo.com) owner Hoang Mai's perfectly balanced beef broth: a long-simmered brew, artfully enhanced with hints of cinnamon and brought to its full potential with the addition of fragrant, fresh Thai basil at the table. 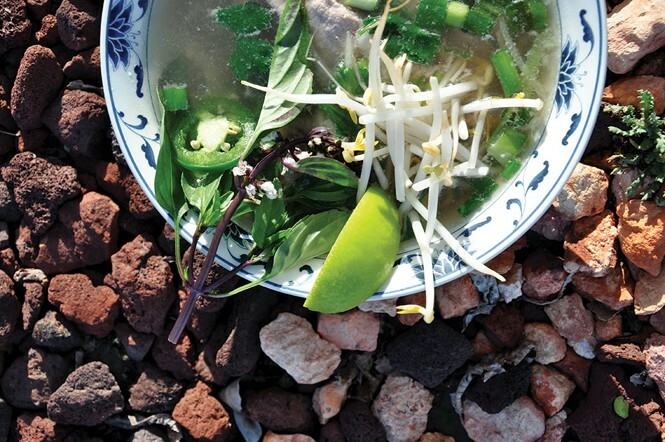 Classic pho options include rare steak, well-done flank, tendon, meatballs, well-done brisket and tripe, plus others. Plan an excursion to Salt Lake City's Avenues neighborhood and when you do, be sure to stop in at one of its charming dining establishments. With a feel like it's in Portland, Ore., or Berkeley, Calif., Avenues Bistro on Third (564 E. Third Ave., 801-831-5409, AvenuesBistroOnThird.com) is a cozy, eclectic eatery with a big focus on local, artisan foodstuffs. The spicy chicken with crunchy tortilla coating is outstanding, as is the service and friendly owner, Kathie. Meanwhile, Avenues Proper Restaurant & Publick House (376 Eighth Ave., 385-227-8628, AvenuesProper.com) combines a microbrewery—Utah's smallest craft brewery—with a hip, full-service restaurant. Stop in for a brew and the killer duck fat-tossed "Prop-corn" or go whole hog with Proper's poutine. Located about a 60-second walk from the City Weekly offices is a hidden gem called From Scratch (62 E. Gallivan Ave., 801-538-5090, FromScratchSLC.com) where, as its name suggests, virtually everything on the menu is made from scratch, including doughs milled in-house, housemade ketchup and mustard, mozzarella and more. The Margherita pizza here is, quite simply, the best in town. Since opening a few years ago, The Copper Onion (111 E. 300 South, 801-355-3282, TheCopperOnion.com) has seen few quiet moments. An instant hit, Ryan Lowder's restaurant attracts both visitors and loyal locals by the throngs. Whatever else you eat here, be certain to include a side of scorched shishito peppers and the signature ricotta dumplings made from ricotta produced in-house. For many, myself included, Takashi (18 W. Market St., 801-519-9595) isn't just the best Japanese restaurant in town; it's the best restaurant period. The restaurant doesn't take reservations, and a line forms promptly at 5:30 p.m. each evening as patrons wait their turn for Takashi's superb sushi, sashimi, nigiri and cooked dishes. Nobu ain't got nothin' on this place. Consider a couple of canyon restaurants, just a short drive from downtown. Ruth's Diner (4160 Emigration Canyon Road, 801-582-5807, RuthsDiner.com)—a Utah tradition since 1930—is located in lovely Emigration Canyon, and was originally situated in the old trolley car. Today, the sunny, sprawling patio is a favorite spot for breakfast and lunch, and classic dishes like meatloaf and pot roast still pepper the menu. Just 4 1/2 miles up Millcreek Canyon is another classic Utah dining destination: Log Haven (6451 E. Millcreek Canyon Road, 801-272-8255, Log-Haven.com). It's a historic log mansion in the Wasatch National Forest surrounded by a lake, cascading waterfalls, ducks (and a very friendly cat) roaming the grounds, featuring the creative cuisine of longtime chef Dave Jones. In the 15th & 15th neighborhood of Salt Lake City is a small "restaurant row" that packs a big punch. Fresco Italian Cafe (1513 S. 1500 East, 801-486-1300, FrescoItalianCafe.com) is located in a small house with garden-patio seating (in warm weather). The upscale menu features fresh, local and seasonal ingredients with dishes such as tortelli in brodo, Meyer lemon and parsley gnocchi, and Wagyu-beef panzanella salad. A couple of doors down is Mazza (1515 S. 1500 East, 801-484-9259, MazzaCafe.com), a Middle Eastern restaurant with options ranging from falafel, shawarma and kebabs to complex dishes such as lamb and rice dolaa. And, for a taste of France, head across the street to The Paris Restaurant & Zinc Bar (1500 S. 1500 East, 801-486-5585, TheParis.net). The Paris' bistro fare includes classics like escargot, foie gras de canard and duck confit, as well as Provençal and Mediterranean dishes. Now, get out and enjoy a taste of SLC!